The wintery season can be one of the harshest season for a roof. When we have ton of snow fall, our roofs that we have in place are used to keep us from cover. But in the turn of snow, the roof can take a lot of damage from the snow fall itself. With professionals on standby, you can have this snow removed in a fast and safe manner, leaving your roof clean and snow free. When the snow comes down hard, the snow builds up on the tips of the roofs and sometime more heavier in spots than others. If you are outside a drift can cause the snow to fall maybe on you or a pet, or someone walking by. This is a very hazardous condition to contend with. 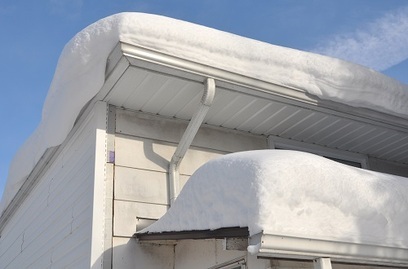 Along with drifts, the roof itself can incur damage. With buildup in high-end places can cause the roof to sag and lead to cracked roofs or water damage. This can lead to mold and structure damage to the home or business. Most roofing systems contain a membrane system. This includes several different layers that are imposed in the roof and then covered either with gravel or shingles. The membrane is the heart and soul of the roof. It incurs the most weight as well as holds the heart and cool air in the home or business. Our professionals know exactly how to remove the snow with the damage of this membrane. It is vital that this portion of the roof is not altered to keep the system intact. With our top of the line equipment and technology, our snow removal professionals will remove the snow, and not damage the membrane of the roof. This gives you the satisfaction that your roof will be snow free, and not damaged in the process. Snow and roofs is a bad combination altogether. With our team of professionals, we take safety very seriously. We know that roofs can be very dangerous during the winter season, not only for us but for you as well. With our removal of snow, we take away the hazard of drifts that might fall on you or people passing by, by also we take all the necessary actions to remove the snow in a safe manner so that it does not hurt us as well. With our snow removal experience it’s a win, win situation. Your roof will be snow free and all hazards will be removed. Toiture Montreal Roofing is here to take care of all of your snow removal needs. We take your roof very serious in your time of need. With safety and experience in mind, call or fill in the form on the right today to get your roof snow free.